"Quantifying general principles of life—not restricted to a domain on the tree of life, or a particular ecosystem—is a challenge," says Smith. 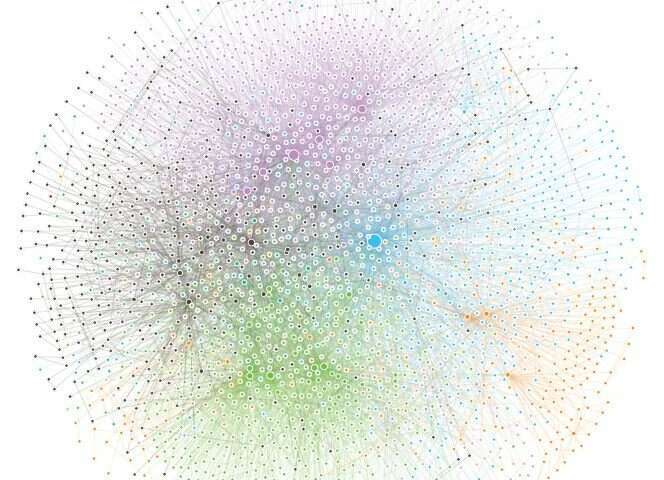 "We were able to do that by combining tools from network science and scaling theory, while simultaneously leveraging large genomic datasets that researchers have been cataloging." "Understanding the organizing principles of biochemistry at a global scale better enables us to understand how life operates as a planetary process" says Walker. "The ability to more rigorously identify universal properties of life on Earth will also provide astrobiologists with new quantitative tools to guide our search for alien life—both in the lab on other worlds"
Life as a whole system looks disordered to me (as we see in the figure). Life decreases entropy locally in order for an organism to grow. But it does so only because of complex pre-existing templates and only at the expense of an even bigger disorder that they cause, by producing waste, nutrients, gases,etc. But these waste become food for other organisms in a constant recycling of nutrients. So chemically speaking, we are ignoring the big chemical picture and we are cherry picking the reactions that look like us, or we consider important, etc and we name them alive. If we view life as an entire chemical system, life becomes just what we perceive of some regular complex chemical reactions (Any complex process will appear self-organizing to the eyes of the results). Its a self-fulfilling prophecy. This gives a natural explanation because there is no need to wait eons for rare unlikely events to happen, or order to be created and start propagating,etc. The point of the paper is that it did not ignore the big chemical picture, yet it found order. It is a fact that cells work like refrigerators, internally lowering entropy by exporting it (locally, I would add, but of course entropy eventually exports to space). That regularity is evolved homeostasis, which borrow its main feature of keeping a (dis-)equilibrium from Le Châtelier's principle [ https://en.wikipe...rinciple ]. That life likely evolved in such conditions in hydrothermal vents, and rapidly so easily, agree with that it was neither unlikely or had to "re-evolve the wheel". Though evolution is of course contingent ("random") too. Some finds are that random (bio-)chemistry do not show scaling laws, but biology does from metabolic up to ecological and they can test for that (e.g. life or non-life). In my eyes likely as a result of constrained evolution imprinting the scaling behavior, a hypothesis supported by that they can distinguish through test large clades (Archaea, Bacteria, and archaeal Eukarya). I would consider these findings & conclusions as helping to confirm ore-biotic chemistry assembling to biology as a randomly automatic process of indeterminate, unpredictable organization. With a who;e lot of failures. Out of a dozen or so small, rocky planets in this star system? Only one, the Earth, was able, is able to sustain a biosphere. So there are natural constraints for originating & maintaining Life. No need to twiddle your thumbs waiting for a supernatural spooky to make up it;s damn mind which planets will be dealt the marked cards of divine intervention.